Hailing from Portland, OR, Matt Hundhammer grew up splitting time between year-round ski slopes on Mt. Hood and the frigid waters of the North Pacific. Like a sponge, Matt soaked in the progressive and ecological mindset of the PNW, leading him south to Eugene, OR where he studied Environmental Studies at the University of Oregon. After graduation, Matt was invited out to Utah to write and design Alta Ski Area’s SKE-COLOGY on-hill environmental education program. In 2013, Matt became the brand development manager at Soul Poles in Park City. To raise awareness for the brand, Matt coordinated, promoted and hosted two winter season, corporate-sponsored, pop-up workshop tours throughout North America west, bolstering the brand’s identity and on-hill presence. 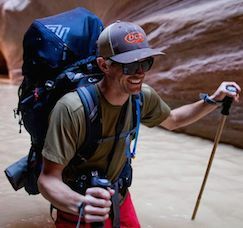 With a passion for sustainability and corporate responsibility as well as grassroots and digital marketing experience, Matt brings knowledge, expertise and tenacity to the Alpine Collective’s outreach marketing efforts, helping us build awareness and engagement for our social and sustainability initiatives.